I really love stuffed portobello mushrooms. They are so creamy, warm and delicious. I make them all the time and am always looking for new ideas on how to prepare them. This idea for using Laughing Cow cheese came to me in my sleep last night. Laughing Cow Stuffed Portobello Mushrooms. Normally I just use rice, bread crumbs and cheese to stuff the mushrooms. This recipe is a little different, since I was trying to come up with a low carb version of the traditional recipe. This recipe has the creaminess of the French onion cheese as a base and is just delightful. My meat eating husband gave these a thumbs up at dinner tonight! 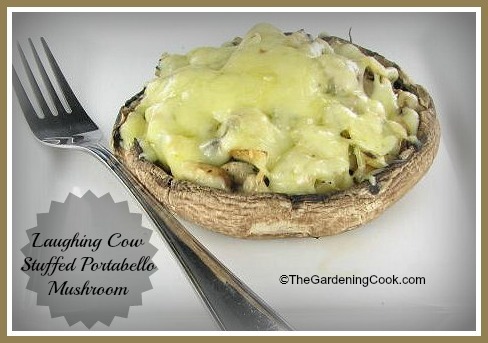 The Portobello mushrooms are first layered with chunks of the laughing cow cheese and then topped with caramelized onion, garlic and white mushrooms. Top the whole thing with Jarlsberg cheese and you have a great side dish taste sensation. For more healthy recipes, please visit my Facebook Page. Lighten up the traditional stuffed mushroom recipe by using laughing cow cheese to top it. 1 tbsp of fresh oregano. 1 ounces of Jarlsberg cheese. Combine the onion, mushrooms and garlic with the olive oil and cook until the onions have caramelized, about 2 minutes. Add the spices and season to taste. Set aside. Remove the gills and stem from the portobello mushrooms. Add 1/2 of the onion mixture on top of the cheese. Finish with the Jarlsberg cheese. Bake in a preheated oven for about 10 minutes until the cheese melts.